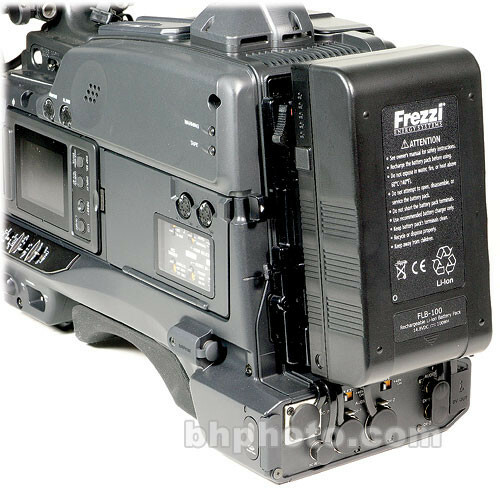 The Frezzi FLB-100 is a 3-stud mount (Anton Bauer) Lithium Ion battery offering a fuel gauge. It runs at 14.8 VDC with a 100Wh capacity. Li-Ion batteries can deliver 40% more capacity than comparably sized NiCd batteries and are one of the lightest rechargeable batteries available today. A 5 Stage LED readout offers the user a quick reference for remaining battery power. The 14.8V design complies with equipment manufacturers specifications, eliminating all 12V battery cutoff problems. Works with Anton Bauer Gold Mounts. Box Dimensions (LxWxH) 7.95 x 4.3 x 3.6"